A perfect red square makes several amazing transformations, moving through the color wheel and the days of the week. The versatility of the art work, as the square is divvied up differently on each page, either cut, torn, or shattered into pieces and rearranged into another pleasing configuration is something to admire. Cut up and poked full of holes, it makes itself into a fountain that "babbled and giggled and clapped." Shredded into green strips, the square becomes a park. Turned purple and crumpled up, the square becomes a mountain. After becoming a perfect red square again, the square feels "confined, rigid and cramped"... and so transforms into a window to look upon a scene that pulls everything together: the mountain, the river, the park, flowers, and fountain with children playing nearby. The slightly variegated texture and the collage-like nature of the artwork made me think of Eric Carle. The trim size, logically, is square and shows how much thought that has gone into little details in the book's design. 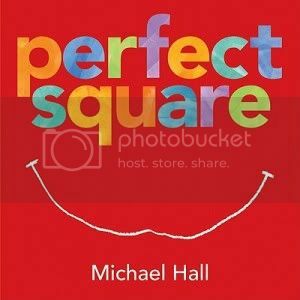 Simple yet appealing, with large, easy-to-see pictures, this book is sure to be a hit as a read-aloud. Highly recommended.